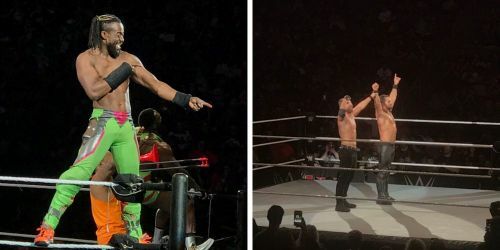 WWE Live went to Hershey, PA, and it was as enthralling as ever. It was a dual-branded PPV, so not only did we get to see a couple of WrestleMania match previews, but we also witnessed a RAW vs SmackDown main event. Without any further ado, here's what went down at the live event! We got a big WrestleMania preview, as Buddy Murphy defended the WWE Cruiserweight Championship against Tony Nese. Though Nese is definitely going to try harder at WrestleMania, he was unsuccessful on the night, as Murphy continued his Cruiserweight tile reign. Finn Balor took on Bobby Lashley in the second WrestleMania match of the night. It was an Intercontinental title defence, and while Balor came extremely close to winning the Intercontinental title, it ended in a count-out just like the previous time. Elias would grace Hershey with his presence, but he was interrupted as usual, by an unlikely name - Becky Lynch. The Man would have her fair share of fun at Elias' expense, as she sang a song of her own. Elias, being Elias, was relentless even after this, and would appear three times in the live event.